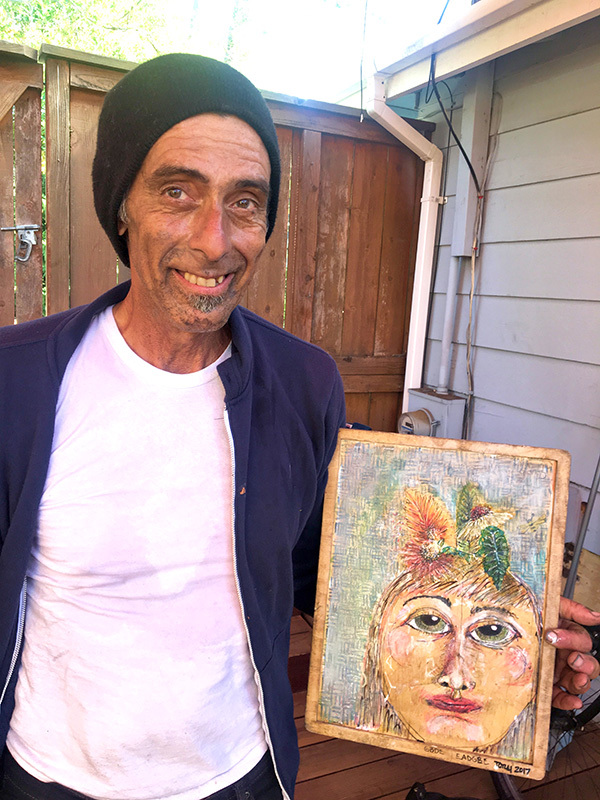 For the record, Tony is not — and never has been — an addict or an alcoholic. And he doesn’t suffer from a mental illness. Gaming the bureaucratic system is also out of the question: He has never applied nor received a single disability check. One individual tried to poison Tony, another offered him a sandwich filled with glass shards, while another gave him a sandwich oozing with the hottest sauce “you could ever imagine.” And yet, despite people “wreaking havoc to beat you down,” Tony overwhelmingly believes that most people are generous and kind. 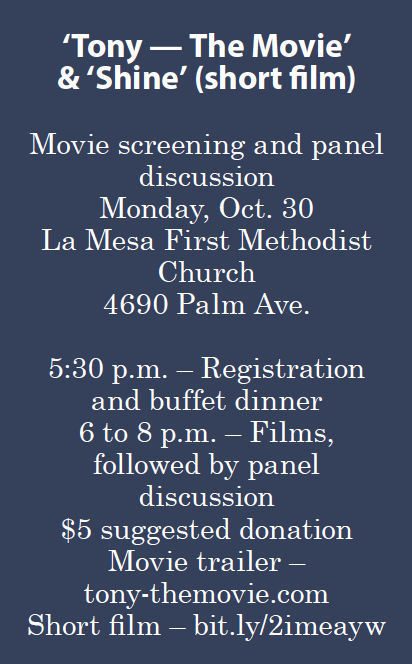 Hobbyist filmmaker Dennis Stein will show the documentary on Oct. 30 La Mesa First Methodist Church in an effort to “jumpstart a community discussion on our region’s homelessness crisis.” The event will also feature “Shine,” an animated short film from Father Joe’s Villages as well as a panel discussion with Stein, Rodriquez, Pastor Elbert Kim and others as part of the La Mesa Conversations series. The event is free but a $56 donation is encouraged. Filmed in 2016-17, the biopic on Tony is also an exposé for implementing solutions to San Diego’s pervasive homeless issue. America’s Finest City ranks fourth in homeless overall, and second in the number of homeless veterans. “Housing first” is the underbelly of the documentary’s message. Stein advocates a regional plan emanating from San Diego’s political affiliates and elected officials including mayors, county supervisors and City Council members, to replace programs that serve only as bandages and not resolutions. According to Stein, transitional housing cost $36,000 per year and often loses participants who can’t adhere to program rules. Tenting — shelter tents — costs $6,000 a year per person. 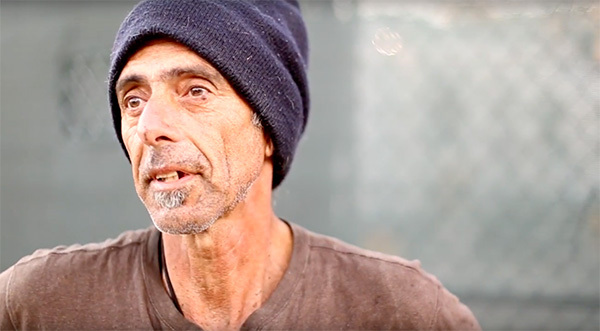 Facing a “tsunami of rising costs,” Tony explained how San Diegans “living on the edge of homelessness” are often priced out of their apartments. Residents get evicted without being offered alternative housing. And yet, Rodriguez remains sympathetic to the public’s understanding of housing first. Job hunting is also impeded by a lack of housing. Police enforcement remains a tenuous issue. The city of San Diego was cited and successfully sued for ticketing people who slept on the streets. Individuals now have the right to sleep on “certain streets” unless an alternative is provided. Ticketing is no longer allowed between 9 p.m. and 5 a.m. unless subjects engage in illegal activity or disturb the peace. However, street dwellers must be gone by 5:30 a.m. or they face jail or losing their possessions. Ultimately Tony hopes to live with Ginger and Bambi and work as an artist. “Even a garage will do.” But at the moment nothing’s changed. He works odd jobs for Stein, while Ginger watches their things. Tony also spoke of the importance of his faith. Transformed by the filming experience, Tony plans to continue to champion housing first. Stein added his own commitment. — Contact Lucia Viti at luciaviti@roadrunner.com.